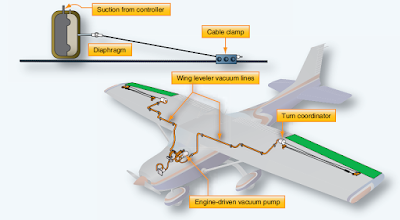 An aircraft automatic pilot system controls the aircraft without the pilot directly maneuvering the controls. The autopilot maintains the aircraft’s attitude and/or direction and returns the aircraft to that condition when it is displaced from it. Automatic pilot systems are capable of keeping aircraft stabilized laterally, vertically, and longitudinally. The primary purpose of an autopilot system is to reduce the work strain and fatigue of controlling the aircraft during long flights. Most autopilots have both manual and automatic modes of operation. In the manual mode, the pilot selects each maneuver and makes small inputs into an autopilot controller. The autopilot system moves the control surfaces of the aircraft to perform the maneuver. In automatic mode, the pilot selects the attitude and direction desired for a flight segment. The autopilot then moves the control surfaces to attain and maintain these parameters. 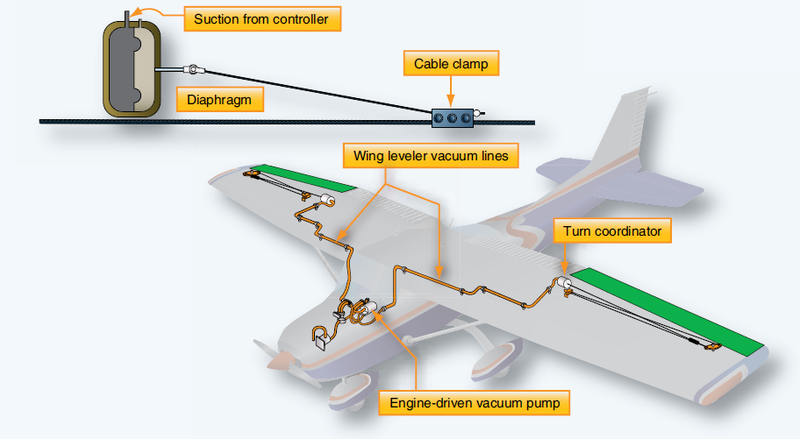 Autopilot systems provide for one-, two-, or three-axis control of an aircraft. Those that manage the aircraft around only one axis control the ailerons. They are single-axis autopilots,known as wing leveler systems, usually found on light aircraft. [Figure] Other autopilots are two-axis systems that control the ailerons and elevators. Three-axis autopilots control the ailerons, elevators, and the rudder. Two-and three axis autopilot systems can be found on aircraft of all sizes. There are many autopilot systems available. They feature a wide range of capabilities and complexity. Light aircraft typically have autopilots with fewer capabilities than high performance and transport category aircraft. Integration of navigation functions is common, even on light aircraft autopilots. As autopilots increase in complexity, they not only manipulate the flight control surfaces, but other flight parameters as well. Some modern small aircraft, high-performance, and transport category aircraft have very elaborate autopilot systems known as automatic flight control systems (AFCS). These three-axis systems go far beyond steering the airplane. They control the aircraft during climbs, descents, cruise, and approach to landing. Some even integrate an auto-throttle function that automatically controls engine thrust that makes auto landings possible. For further automatic control, flight management systems have been developed. Through the use of computers, an entire flight profile can be programmed ahead of time allowing the pilot to supervise its execution. An FMS computer coordinates nearly every aspect of a flight, including the autopilot and auto throttle systems, navigation route selection, fuel management schemes, and more. The basis for autopilot system operation is error correction. When an aircraft fails to meet the conditions selected, an error is said to have occurred. The autopilot system automatically corrects that error and restores the aircraft to the flight attitude desired by the pilot. There are two basic ways modern autopilot systems do this. One is position based and the other is rate based. A position based autopilot manipulates the aircraft’s controls so that any deviation from the desired attitude of the aircraft is corrected. This is done by memorizing the desired aircraft attitude and moving the control surfaces so hat the aircraft returns to that attitude. Rate based autopilots use information about the rate of movement of the aircraft, and move control surfaces to counter the rate of change that causes the error. Most large aircraft use rate-based autopilot systems. Small aircraft may use either.